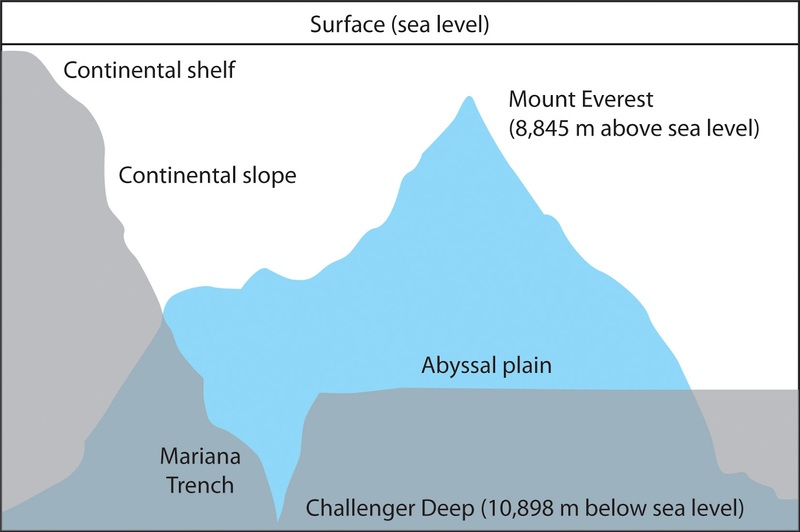 The Mariana Trench in comparison with Mount Everest. James Cameron, the director of mega blockbusters Avatar and Titanic, has reached the depths of the Mariana Trench, a decent of nearly 11 km below sea level. He accomplished this in a 7.3-meter submersible designed to reach the bottom of Challenger Deep, the deepest place on Earth. Cameron is the first person to explore Challenger Deep—located south of Guam in the Pacific Ocean—in a single-person submersible, and recorded this incredible feat on March 26, 2012. The dive follows seven years of planning, including the design and construction of a specialized submarine that could withstand the incredible pressure at the ocean floor, which actually squeezes the sub so much that it reduces its overall length by several centimeters. It took Cameron 2 hours and 37 minutes to reach the bottom and only 70 minute to come back up. Cameron spent a little more than three hours at the bottom of the Mariana Trench before returning. A malfunction in the hydraulic system kept him from bringing back most of his sediment sample. He wasn’t able to close the sample door and lost most of it on the trip back to the surface. Still, Cameron was hopeful that some new microbial species would be found in what he was able to bring back. The Mariana Trench is so remote that we don’t know even the basic of what is down there, other than small invertebrates and arthropods. Scientists do not know, for example, if there are any fish that far down. The only other time that Challenger Deep has been explored was in 1960 when Jacques Piccard, a Swiss oceanographer, and Don Walsh, a U.S. Navy captain, explored the bottom for 20 minutes in the bathyscaphe Trieste. They also had to cut their mission short when they found cracks developing in their viewing window. Piccard passed away in 2008, but Walsh was one of the team members on hand for Cameron’s historic dive. 5 miles under the water is a dark, cold, lonely place to be ..